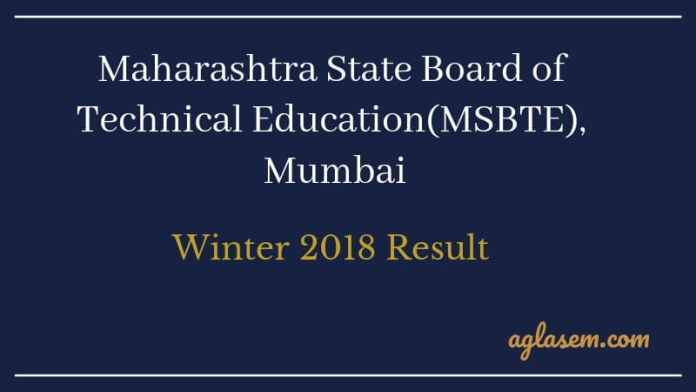 MSBTE Result 2018 releases on the official website of Maharashtra State Board of Technical Education, Mumbai. Candidates appeared for the exam can check MSBTE Result 2018 Winter from this page. MSBTE Result can be checked either by “candidate seat number or enrollment number” is required. Candidates scoring minimum 40% marks in the exam shall be considered as pass. The head of the institution provides the certified certificate of the marks obtained by candidates, in the prescribed form, after the declaration of the results. Candidates appeared for the current exam shall be eligible to apply for the revaluation of the answer script. Check the page for MSBTE Results 2018. Latest: MSBTE has released Winter 2018 Diploma Results. The Board conducts the exam twice in a year ie, Summer and Winter. The exam time table is released on the online portal of MSBTE. The board issues the hall ticket for all the eligible candidates. Candidates appeared/appearing for the exam conducted by the board shall have to write and communicate the answer to the question in the written or oral exam through the medium of the English language only, unless otherwise specified. Candidates can check MSBTE Result 2018 Winter through the link provided below. Candidates can check MSBTE Result 2018 through the link provided above. Click the link and follow the steps to check the result. Candidates appeared for the exam shall fall into one of the following status categories. The status is applicable as per the teaching and exam scheme for a particular course/scheme. II (Second Class): Candidate scoring 45% or more but less than 60% of total shall fall under this category. WFLS/WFLY (Withheld.Failed in Lower Semester/Year): Candidates who pass in the final semester/year but fail in lower semester/years fall under this category. Fail: If the candidate fails to secure minimum qualifying marks or minimum percentage of aggregate marks shall fall in this category. Candidates appeared for the latest exam conducted by the board shall be eligible to obtain the photocopy of the answer book. Maximum of two subjects/courses per semester/year can be obtained. The answer books can be obtained on the submission of the application form. A candidate who has obtained the photocopy of the answer book is eligible for reassessment/re-evaluation of the same. Candidates need to apply by submitting the application form for re-evaluation/assessment. No application form shall be accepted after the after the due date.